1 week has 7 days, 168 hours, 10,080 minutes. That’s a lot of time. If we consider that one is supposed to sleep on average 8 hours per night, that leaves 112 hours for awake time. Which is still a LOT of time. Why is it then that it often seems like the day ran by in a second and we didn’t get anything done?! Time management is a really important skill and most job descriptions show requirements such as well-organized, precision, multitasking, able to work under pressure (among various other superpowers) so, how is it possible to practice these mysterious abilities in the everyday life to get ready for the real game? How can one organize their time? Being organized leads to have a better perspective not only of what needs to be done when and how, but also provides a sense of priority to our duties and most importantly, prevents us from wasting time. In fact, there is nothing more precious than time and when beginning a new task, it is much more efficient to spend a couple of minutes figuring out what are the steps to be followed and the possible options, than wasting an hour trying to tackle the issue switching from one perspective to another. So in the end being organized translates also in being more effective in completing a task. Below are 3 golden tips to help disorganized but motivated people achieving the organizational nirvana. Post-its, to-do lists, calendar apps, more traditional pen and paper, color codes. Anything, literally anything will do, as long as there is commitment and precision on one’s side. 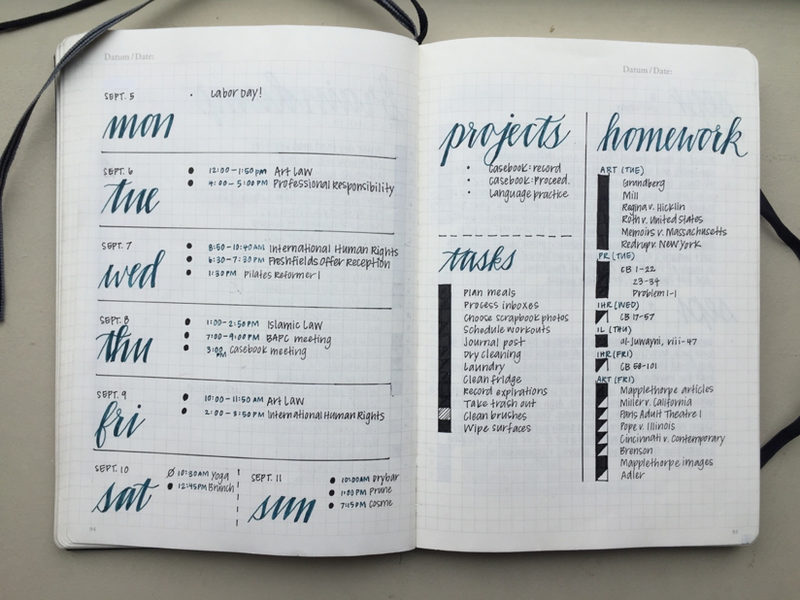 Although some of these methods might seem a bit old-school and boring, there is a recent trend, a bit hipster-ish and very instagrammable, to help boost one’s productivity and organization: the Bullet Journal. A bullet journal is nothing else than an empty notebook that one can fill on a daily basis in with the to-dos, rendez-vous, and the likes that have to be ticked once completed (spoiler alert: leaving to-dos non-ticked can be very annoying). What makes it cooler than a regular calendar (and more instagrammable) is that being its pages completely white, it is highly customizable and thus it is up to the owner to organize, decorate and make colourful. YouTube and Pinterest are full of inspirational material about how to structure it and how to doodle it (according to seasons and moods) and of useful tips about what kind of charts one could use. For example, a person who is on a training program might want to measure their progress and thus will be able to create a personalized tracking chart to visualize it. 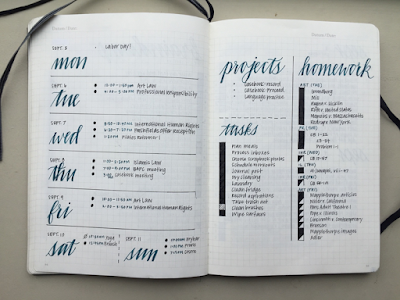 This bullet journal has three main benefits: i) helps not to forget about deadlines and duties, ii) it has a “chromotherapy” effect, as the decorating and doodling part helps to relax and be creative for a little while, iii) it can act as motivation thanks to the possibility of tracing one’s behaviour and progress over time. The saying goes “If you want something done, ask a busy person”, implying that busier people are more likely to carry out unexpected duties. Since student life is so beautiful and professors often come up with last minute extra credit assignments that overworked students have to squeeze in between an essay, a sad sandwich (full of butter because hey, it’s France) and other uncountable group projects (all this without skipping the association’s meeting or the volleyball training), being busy might actually be beneficial. In fact, having a tight schedule helps becoming more prone to take on new projects, and more flexible in switching from one task to another. A little tip to help coping with these tasks coming up, it is nice to schedule the day in such a way that one has always more or less one hour “free” (so to say) to dedicate to those unexpected duties (this helps especially when working in a fast-paced environment, when this happens almost daily, like in start-ups). This is probably something we have heard ever since we were kids: do not postpone to tomorrow what can be done today. Even more, we should take advantage of today’s spare time to start working on tomorrow’s homework. This old-but-gold pearl of wisdom is actually really important even as grown-ups, although it requires a lot of discipline. In fact, when finishing earlier than expected our to-dos or when nothing unexpected comes up (and we have that extra hour scheduled for unexpected stuff), one would be tempted to collapse on the couch watching the latest episode of some Netflix series. However, since we are being trained to become managers and everybody knows that managers need to have a long-term perspective, a strong-willed student would just pick one of the to-dos scheduled for the weekend and do it in that idle time. P.S. Also, this will come in handy especially during an internship, as completing a task a day or two before the deadline might actually make the difference between a farewell with a pat on the shoulder at the end of the contract and an enthusiastic hiring proposal. Being a student can be tough, but with a few tricks it can actually get way easier!